Chinese ginseng is one of two species of true ginseng, both belong to the genus Panax. Also known as Asian ginseng, Oriental ginseng and Korean ginseng, it is a flowering, perennial herb from the family Araliaceae. The word ginseng comes from the Chinese word ‘ren’ that means human and ‘shen’ meaning root of a plant, homage to its unusual human-like shape that is considered as a symbol of divine harmony. The word Panax shares the same Greek origin of panacea that is ‘pan’, which means all, while ‘akos’ is the word for remedy. Interestingly, they also mean Root of Heaven. Ginseng was consumed as food before it became a well-known energy elixir. Once grown wild in the mountainous region of Manchuria, its benefits had been recorded for more than 5 millennia. Its benefits to human appeared in “Shennong Ben Cao Jing”, a book that compiled the plants with medicinal use. Its properties were also written in Hindu scriptures, the Vedas. Ginseng was revered by Imperial families and the wealthy people the in the surrounding regions. Eastern Asia and Eastern Siberia. Panax ginseng is revered as a powerful adaptogen used to revitalize and rejuvenate the mind and body. 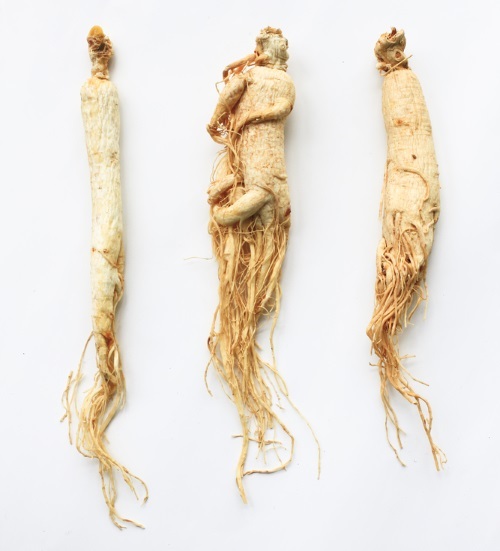 The root of ginseng is usually used raw or prepared either as red ginseng or white ginseng. White ginseng is simply prepared by sun-drying peeled fresh ginseng root until it lost some amount of moisture. The process turns the root into slightly yellow-white in color. Red ginseng is prepared by steaming the root, which turned it red, before it is dried or sun-dried. The ginseng root contains anti-oxidant to reduce physical and mental stress and fatigue. Several tests indicated that the herb is able to boost athletic performance in forms of strength, endurance and agility. Some studies also show promising results on improved alertness and mental capabilities such as thinking agility, enhanced memory and concentration. Panax ginseng can exhibit side-effects, especially for people with digestion problems. It can induce nausea, vomiting, diarrhea and insomnia. Although the herb is not estrogenic, it must be avoided by anyone who is suffering from hormone-related cancer. An individual who is going to undergo surgery also must avoid it, as the herb may interact with the anesthesia. Pregnant ladies and breastfeeding mothers are advised to steer clear from ginseng. If taking any medication or supplement, please consult physician or medical practitioner whether it is safe to consume Panax ginseng to avoid any unwanted herb-drug interaction.